Two weeks of testing so far have given us a few signs of what the coming year might be like. Mercedes are still strong, if not untouchable. Ferrari have improved, as have Sauber who have shown surprising pace. McLaren are very much on the back foot, and are now dealing with the repercussions from Fernando Alonso's accident last week as well. The Spaniard will sit out this final week, with Kevin Magnussen taking his place. With just four more days available to the teams before they have to head home to prepare for Australia, maximising track time and getting as much running to fine-tune the cars will be top of the agenda. Force India are set to bring their 2015 car to the track for the first time, whilst the rest of the midfield look to consolidate everything they've learnt so far so they can put it in practice for when the season kicks off next month. Mercedes and Williams take turns topping the timesheets, with Rosberg taking the fastest time overall. McLaren have a topsy-turvy week - 7 laps on day one, 100 on day two. Day three curtailed by oil leak after 39. Kevin Magnussen deputises for Fernando Alonso for day three, with Button on duty the rest of the week. Force India's 2015 car makes its debut at last, and proves reliable from the outset. 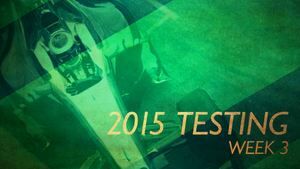 Hello and welcome along, it's the final week of pre-season testing and I'm here to guide you through it! Just four more days for our drivers to really get to grips with their new cars. The big news going into this final stint of testing is that Fernando Alonso will not be present. The Spaniard was only released to hospital today after his accident last week, so Kevin Magnussen will take his place. More info here. McLaren haven't had an easy time of it so far with their brand new Honda engine giving them all kinds of grief. Rumour has it they will run the final four days with part-Honda and part-McLaren components in an effort to get some mileage under their belts. 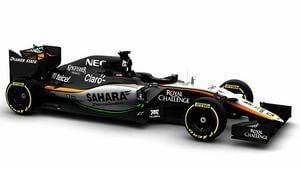 Force India have also garnered themselves some headlines, by unveiling what their 2015 car looks like. The VJM08 is set to make its debut this week, the team finally ready to get some running in the modern car. Other things to watch for this week include the apparent increase in pace for Ferrari, and whether Renault are managing to turn things around for their sole remaining customer in Red Bull (and Toro Rosso). Mercedes were hot on lap counts in Jerez but tailed off in the first week at Barcelona due to various driver ailments. They'll likely be back on it over the coming days. Any excitement about the appearance of the Force India has to be postponed as the team pushed back the test debut of the VJM08 by a day. They're not running on Thursday but should be in action on Friday. Lewis Hamilton, fresh from his appearance at the Brit Awards in the UK last night, set the fastest time of the morning session, although he also completed a short spin due to the damp conditions. It was a clear morning, but then the clouds moved in which kept a lot of drivers in the garage. Hamilton has completed the most laps so far with 48, with Daniil Kvyat not far behind on 45 for Red Bull. McLaren are STILL struggling to piece together a decent day of testing. Jenson Button sat out much of the morning session, completing just seven laps and setting a time more than six seconds slower than Hamilton's best. Tweet from @tororossospy: Someone is hungry! @carlossainz quickly jumps out of the car as morning session ends. 34 laps completed. Toro Rosso have revised their car significantly for this final test. 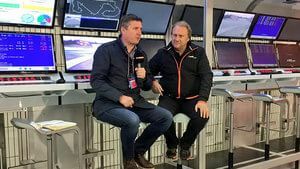 Technical Director James Key admits they've almost brought a brand new machine: "The car itself is radically different here, so we have to start again. It's almost completely brand new - aero, cooling, suspension and the nose is new. It's a Williams direction. We always knew this was the way to go." Force India have planned out their remaining three days of action with military precision: "Our VJM08 is currently on its way to Barcelona; we'll be aiming for action on Friday afternoon and on the two full final days. With the car due to be completed on Friday morning, Hülkenberg is lined up to step in on Friday pm to take the first miles in the VJM08. The remaining two days will be split between him and Pérez, with the Hulk in the car on Saturday and Checo on Sunday." Kvyat and Hamilton managed to up their lap count by being the two hardy drivers that continued running even in the wet. Switching to intermediates, they tested out the Pirelli compounds on the damp surface. I understand wanting to protect the new machinery, but you'd think getting some wet running in would be advantageous for most teams! With the lunch break almost over, the rain has stopped though. So teams should be able to get back to their schedules. Felipe Massa kicks things off as the first car hitting the track for the afternoon session. McLaren never managed to get any further than their seven laps. Just after lunch, they said: "We’re bringing the shutters down on today – a hydraulic leak means we need to change the engine. #TestingIsTesting." Mercedes also found themselves with a problem too big to rectify, and Hamilton didn't leave the garage after lunch. "That's our day done. Problem diagnosed as MGUK failure. Crew working hard to make sure we're back in business tomorrow." Toro Rosso driver Carlos Sainz caused a red flag when his car came to a halt out on track. The STR was recovered, and the team quickly repaired the issue: "We lost a bit of track time this afternoon, but team has done a great job working against the clock & we're out again "
Sauber kept their driver busy with Marcus Ericsson attempting a race simulation. He completed the most laps of the day with 122, but was pipped to the fastest time by Felipe Massa. Daniil Kvyat appeared to have a solid day of running but the team weren't fully satisfied. Newly installed Head of Race Engineering Guillaume Rocquelin: "Not a perfect start to this final test. After we sorted a small problem Dany had on the install lap, we ran well in the morning and got through some shorter runs, turning the car round quickly in the garage after set-up changes and trying to build up some performance. "However, then the rain came and that set everything back a bit. In the afternoon we were planning on a long run but about 10 laps into his stint, we noticed a problem on the car and Dany came back to the garage. We felt it would be better to wait for some new parts overnight so we went back to shorter runs in the late afternoon and we’ll probably do the same first thing tomorrow morning until the parts are onboard." Mixed conditions across the course of the first day. Ferrari also suffered plenty of niggles during the day that technical director James Allison found very frustrating: "This wasn’t an easy day for us as we spent time chasing our tails on an annoying reliability problems which by the end of the day we managed to put to bed, but that interrupted our programmes for the day quite considerably. Now we can put what we learn today in place for tomorrow so to have a day much more like we want to have." Tweet from @Ericsson_Marcus: Race starts, pitstops, race simulation and a few runs on Soft and Supersoft. Couldn't ask for much more! Very good day for preparing for the season opener. Whilst most of the teams struggled at some point during the day, Williams appeared to be having a whale of a time. Felipe Massa topped the times and said afterwards: "It was a good day for us and the car behaved well. When we tried to use the new soft tyre we managed to get some quicker laps in. The FW37 never showed a sign of an issue and this has been the case since we arrived at the first test in Jerez." There's been a lot of concern about McLaren's lack of running so far this test, with the team only managing just over 200 laps with just three days to go. Compare that to Mercedes, who have easily hit 1000 and continued onwards, it's a disappointing start. That all changes today (maybe), with McLaren completing 44 laps and it's only lunchtime! As the team tweeted: "44 laps and lots of data to digest as we break for lunch.". So much data, they won't know what to do with themselves! Meanwhile, attention has also been on Force India, who finally rolled out their 2015 car today. The VJM08 appeared for its very first installation lap just before lunch... and picked up a puncture. Oops. Tweet from @ForceIndiaF1: 5 laps for @NicoHulkenberg in this morning session as the VJM08 hits the track for the first time. Lots more work planned for the afternoon! Sauber have picked up the pace again, with Felipe Nasr posting the fastest time of the morning. Max Verstappen leads the lap count though, with 78. The Toro Rosso was also spotted with some of that bright green flo vis paint as the team analyse their new upgrades in Barcelona. Red Bull and Williams are also in full analysis mode, running at times with those big criss-cross sensors either side of the cockpit. They must be very distracting to drive with, or near. Mercedes have cleared up whatever problems they had yesterday, with Nico Rosberg in the car and managing 65 laps by the time the morning session came to an end. Lewis Hamilton has been spotted hanging about in the garage as well, I reckon their rivalry is starting early this year! An update from Fernando Alonso, who is out of hospital and recuperating... and slightly missing being in the car! McLaren were keeping busy in Alonso's absence though, finally managing to get some good running in. They topped 100 laps by the end of the day! Although Button did stop out on track and bring out the red flag on that 100th lap, which was a bit awkward. There were a lot of high lap counts today as teams really put the hammer down. The lowest number was 77 for Force India, with Nico Hülkenberg driving the 2015 car for the first time. Only he, Kvyat and Bottas missed out on reaching the century today. Tweet from @tororossospy: Max's day is ends early due to an electrical problem. He's still smiling though... He's happy with his 139 laps! Jenson Button: "We’ve got a lot of work still do to, but we had a good day today. It’s never easy when you’ve missed out on so much testing, but we’re making good progress, and we got lots of really useful information today. "We know we’re not the quickest guys out there, but you’ll certainly see a lot of improvement by the time we get to Australia." People are really starting to worry about the pace Mercedes may have been hiding up to this point. @karunchandhok: "Someone from a rival team told me they didn't see Nico open the DRS on his quali runs... If his eyes didn't lie, that's even more worrying!" Kevin Magnussen will get to make his F1 return tomorrow, with just one day of running in the MP4-30 before Button finishes up the testing on Sunday. Tweet from @MercedesAMGF1: That'll be us for the morning session - experimental setup changes underway so the #F1 W06 Hybrid remains parked @Circuitcat_eng for now. Quiet morning so far for the third day of testing. Mercedes have been hard at work in the garage, preparing for some set up work this afternoon. Massa has been near the top of the timesheets for much of the morning. Magnussen is at the rear of the field pace-wise, but the team have already said they're working on set up rather than speed today. Tweet from @pirellisport: Track temperature is up to 26 degrees already; we might have a good chance of breaking yesterday's record of 29! The lunch break is almost over, and it's given Ferrari time to reflect on their morning: "The team’s programme focused mainly on further aero and set-up testing, while the plan for this afternoon is to run the car in race configuration. An electrical problem, combined with some pre-planned work, required a long stop in the garage. However, Kimi was out on track again towards the end of the morning, setting the second fastest time so far." Tweet from @tororossospy: As @carlosainz completes lap 10 of day, it’s 1000 laps in testing: 4573kms, nearly 35 Million @redbull cans in a row! 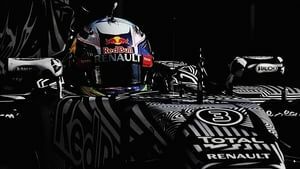 I suppose these are the last two days we will see the crazy eye-bending Red Bull livery. Make the most of it! 60 laps for Daniel Ricciardo this morning, a good effort. McLaren's run of positivity came to an end, then, after the team called their day to an early halt after the car suffered an oil leak. Kimi Räikkönen was having a better time of it, pounding the laps in to complete a full race simulation. Tweet from @ForceIndiaF1: Talking about warmth, the track temp keeps dropping. If it drops any lower, we'll send a Zamboni out on our next run. Couple of red flags this afternoon, with both Sauber and Toro Rosso seeing their cars stop out on track at turn three - but at different times. Lots more centuries today, with only Lewis Hamilton topping the times after just 76 laps, and Kevin Magnussen stopping early for McLaren with only 39 laps complete. Everyone else piled on the kilometres, getting as much running as possible on the penultimate day of the pre-season testing. Rod Nelson, Chief Test & Support Engineer at Williams: "It was Felipe’s last day in the car before Melbourne and we have had a busy day. We focused on chassis and aero work as well as longer runs on scrubbed tyres to see the degradation and tyre performance. "We did a grid simulation at lunchtime to ensure the procedural processes are all in place for when we arrive in Melbourne. We have just one day of the test left now, and it will be another busy one for the team." He may have only managed 39 laps, and the team may be enduring a really poor start to their season preparation, but Kevin Magnussen is feeling positive about the new McLaren: "It definitely feels like a completely different car. It doesn't feel related to last year's car, it's completely different. It's just very consistent, very predictable, very smooth in a way. Just driveable. Last year's car probably had more downforce but was much more sharp and much more on the limit and unpredictable in a way." Lewis Hamilton topped the times, and Mercedes have looked particularly strong recently, but the defending champion doesn't sound like he had a particularly fruitful run: "It wasn't a particularly spectacular day. The track seems to have lost a bit of grip in the last few days so the feeling wasn't as good. But I'm still glad we got some running done and I feel good in the car. We were trying to understand a few things today with the setup and it gave us a clearer indication of that in the afternoon." There was light rain ahead of the final day of testing but the track was mostly dry by the time the lights went green. After an hour, Red Bull brought out the first red flag, stopping at the end of the pit lane - a familiar sight for the camouflaged car this week. They didn't appear out on track again during the morning. Williams were quick on the pace with Bottas heading towards the top of the timesheets, Mercedes started piling in the laps whilst, surprise surprise, McLaren had a terrible start to the day, remaining in the garage with the car in pieces. They completed one installation lap before lunch, prepping for more running afterwards. Bottas dipping back into the garage after a successful tour of the track. Bad news for Lotus, as Pastor Maldonado crashed into the tyre barriers just after lunch. He was unharmed, and said afterwards: "My braking was compromised coming into turn four, meaning I went off the track and hit the barriers. I was able to brake and slow, just not as much as the maximum otherwise possible. "The car was not too badly damaged and I am fine, but it’s a shame we had this issue as we would have been looking at running the softer tyres in the afternoon and putting in some fast laps." One more red flag during the afternoon for Max Verstappen in the Toro Rosso, who caused a lengthy stoppage after parking up on an escape road. McLaren eventually managed to complete 30 laps and were penultimate on the timesheets to Lotus, who only did 36 thanks to Pastor's crash. Four drivers hit the century, including, of course, Mercedes, who added a whopping 148 laps to their tally, but didn't pick up the pace today. 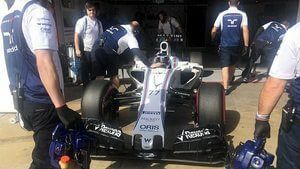 Valtteri Bottas, having topped the times for Williams for the final day, is understandably happy and thankful for the state of the car: "It was a really good day and a great way to finish the test. One of the main points we have learnt is that the FW37 is very reliable. The car we are taking to Melbourne is very competitive and should make for an interesting start to the season. We have made the most out of our time testing and I need to say a really big thanks to the team." A glimpse at the fastest times across the two Barcelona tests, all eight days, shows that Rosberg had the best time of it. The two Mercedes times were completed on soft compounds, whilst the Williams were on super-softs. Tweet from @ForceIndiaF1: 130 laps in the bag for @SChecoPerez today as our winter testing comes to an end, testament to the hard work of everyone in the team. Tweet from @pirellisport: We've had a few questions about the unmarked tyres. They are prototype mediums. Winter hards have already all been used. In terms of performance, there's no difference between prototype mediums and 2015 mediums. Some different materials, that's all. It was Sergio Pérez's first and only time in the 2015 Force India car, and he's positive about the experience: "It's no secret that we have some catch-up to do but I am optimistic: the team has a clear direction to work towards and we have been able to collect a large amount of data in such a short time, which will help all those working back at base. Every run we do, here or at the races, teaches us a lot and moves us closer to where we want to be." Tweet from @ToroRossoSpy: So testing comes to an end. We've completed 1207 laps, 5536 kms - that's enough to drive from Faenza to Bahrain... on our way to Melbourne! So with all twelve days of pre-season testing complete, and the next step Melbourne, what have we learned? McLaren are very much on the back foot. All the other teams went through this and came out the other side, so McLaren will too, but that's the point. All the other teams have done this already. 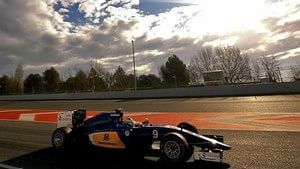 Ferrari, Sauber and Force India all have a variety of improvements over last year, but the kind that won't really become obvious until the racing starts. Williams remain strong, but it's still Mercedes that are dominating. So far, Red Bull haven't looked too promising in testing, but then again, they have done far better than this time last year! There's a lot to look forward to in the coming months, starting with the Australian Grand Prix in just two weeks' time!